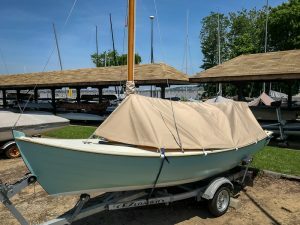 "I've had BELLE out a few times in her new digs and I must say, with the enamel paint on the bottom and the McLube Hullcoat, she's one slippery little thing...And her acceleration out of a tack is very good." I’m hoping he’ll have some photos of her under sail in her new location at some point this summer. He’s also been working on some other projects for the boat, I hope to hear more soon. Stay tuned. BELLE at her new marina on the Potomac, near Washington DC.